KAWS: Where the End Starts, the exhibition now open at the Modern Art Museum of Fort Worth in Texas, consists of varnished, cartoonish figures and obfuscated pop culture symbols that contain a disturbing truth: we’re just dolls, adorable but shamed, oppressed by consumer culture in the guise of collectors’ clamshell protectors. That’s the fascinating chill behind (and sometimes inside) the whimsical exterior of the work of artist-designer Brian Donnelly, otherwise known as KAWS. But elevated is indeed what we have here. A sleek and mature presentation, the Brooklyn-based artist never strays too far from his graffiti roots and design house training, which are especially evident in his paintings. For instance, the ever-faithful Snoopy from Charles Schultz’s Peanuts comic strip is a recurring subject in the exhibition. In one, the profile of Charlie Brown’s dog is painted in streaks. In another, larger work, Snoopy is dissembled, his parts rearranged in a collection of small frames, though the character is still recognizable. Like I said, chilling and whimsical. KAWS has given cultural icons The Simpsons a similar treatment in the form of his The Kimpsons (2000) paintings. Bastardizations of the animated cast from the show, these symbols of the long-running series are encased in clamshell cases. KAWS’ own Companion is ever-present, a doll-like icon that towers over it all. In some depictions, Mickey Mouse‘s gloved hands cover its X eyes. In another room, a group of wooden sculptures encircles a mammoth, embracing pair. And the sculptures are definitely the standouts here, and the main draw. The exhibition, put together by Modern Art Museum of Fort Worth curator Andrea Karnes in collaboration with KAWS, is meant as a sweeping display of the artist’s work over the last two decades; room after room, it is creepy and charming, cute and uneasy. Pop art, graffiti, sculpture, commercial design, and the refined trappings of the ivory towers of the art world ripped open. It is KAWS in his dynamic mastery of subversion. 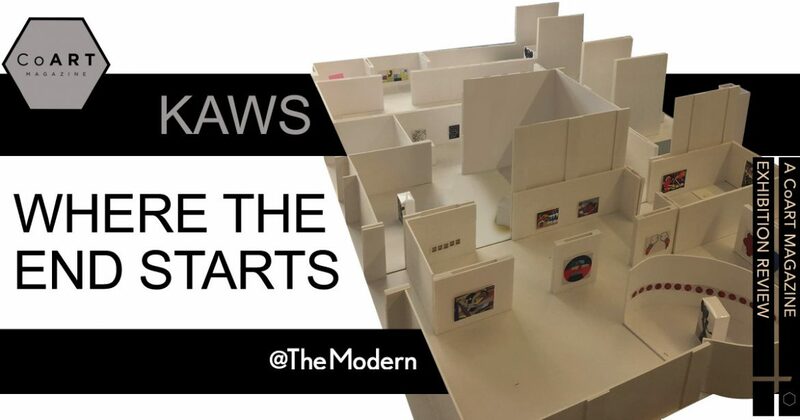 KAWS: Where The End Starts will be exhibit until January 22, 2017 at The Modern (3200 Darnell St, Fort Worth, TX 76107). Afterwards, the retrospective will travel to the Yuz Museum (35, Fenggu Road, Xuhui District, Shanghai, China) for display from March until August of 2017. José R. Ralat is the food editor of Dallas-based western lifestyle magazine of Cowboys & Indians. He is also the writer behind the Taco Trail blog, for which he has written hundreds of reviews and explored the history of tacos. Ralat has written for both local and national media outlets, including D Magazine, Imbibe, MUNCHIES, Thrillist, and Texas Monthly. He is also the author of the forthcoming survey of tacos in the United States, American Tacos: A History and Guide to the Taco Trail North of the Border.